Framed by the frigid summits of the Sierra on the west and searing Nevada desert a few miles to the east lies a forbidding slice of California, a place of extreme conditions where even today a mis-step could leave you lost to perish in wilderness. 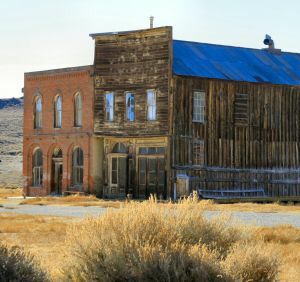 Between Lee Vining and Bridgeport on Highway 395, head east on a road often closed for harsh conditions to a remote, spooky and fascinating site…Bodie, California’s most complete ghost town. During its heyday in the 1880’s, 30 different gold and silver mines roared with thousands of workers, dirt streets bustled with saloons and hotels, assay offices and jails, the graveyard saw a new resident daily, victim of the lawlessness that characterized mining towns. Families made the treacherous wagon trip from The East bringing the civilizing effects of general stores, barber shops, schools and churches. By 1938 the last mine ceased operation and everyone drifted away leaving behind goods on shop shelves and furniture in homes. 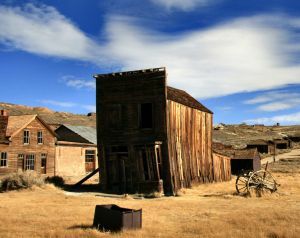 Bodie became a state historic park in 1962 and is maintained in a state of “arrested decay”. Bodie is much more complete than we anticipated. From the car park we gaze over a wind carved plain dotted by a hundred wooden structures. Along the hillside overlooking the town sprawls the buildings of the Standard Mine, long closed but still looking serviceable. Main Street holds a clutch of crumbling mercantiles, the I.O.O.F. Hall and the morgue, their embellished interiors visible through dust-caked windows. The lobby of a hotel displays a faded velvet settee, a carved-legged side table and peeling brocade wall paper. 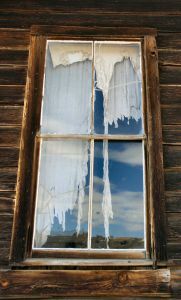 Much of what remains in Bodie after the destruction of fires and time are private homes and they are particularly poignant. Small decorative touches add softness to front doors, reminders of the desire to make lovely a home built in a stark environment. We peek in and see rooms barely as large as a modern bathroom crammed with wood plank beds only 12-inches wide. Home-built furniture clusters around wood burning iron stoves that served as the source of heat…life…during several months of below zero winter temperatures in Bodie. Tattered cotton drapes the windows, the remnants of curtains that closed out snooping neighbors in times of births and deaths. After hours of wandering the streets, peering into the not-so-long-ago past, we return to our car and retrace the drive back into the present. At the last vista point we pull over to marvel at the completeness of the town, take a final picture and leave Bodie to its ghosts.